Nickelodeon and Broadway Across America bring Storytime Live! to the Citi Performing Arts Center Wang Theatre in Boston this spring, playing 6 performances on Saturday, May 22 and Sunday, May 23. Storytime Live! is the first-ever live family theatrical tour featuring characters from four of the current top-rated preschool shows on television today: Dora the Explorer, The Backyardigans, The Wonder Pets! and Ni Hao, Kai-lan;. Preschoolers and their parents can see their favorite Nick Jr. characters come to life in one action-packed on-stage adventure hosted by Nick Jr.’s Moose A. Moose and Zee. The tour will visit more than 70 cities in 2010. Each segment of Storytime Live! takes kids and their families on a different brand-new adventure, whether its leaping into Fairytale Land with Dora and Sleeping Boots, journeying through Filthingham with The Backyardigans, hopping into Wonderland with the Wonder Pets! or jumping on clouds with Kai-lan and the Monkey King. The Storytime Live! creative team comes with a diverse theatrical background and includes: Director Sam Scalamoni (Associate Director: Lestat and Beauty and the Beast on Broadway); Scenic Designer Josh Zangen; Costume Designer Patrick Bevilacqua (Thomas and Friends: A Day at the Circus, Costume Designer;); and Choreographer Wendy Seyb. Additionally, the creative teams for each of the Nick Jr. shows featured are part of the production, including: contributions from Sascha Paladino, head writer for Ni Hao, Kai-lan; Janice Burgess, creator of The Backyardigans; Josh Selig, Billy Lopez and Little Airplane Productions, Inc for Wonder Pets and Valerie Walsh-Valdes, co-creator of Dora the Explorer. Nickelodeon has produced several of the top quality theatrical and touring shows for kids and their families which have drawn more than 2.5 million attendees in 12 years. Nickelodeon, now in its 30th year, is the number-one entertainment brand for kids. It has built a diverse, global business by putting kids first in everything it does. The company includes television programming and production in the United States and around the world, plus consumer products, online, recreation, books, magazines and feature films. Nickelodeon’s U.S. television network is seen in almost 100 million households and has been the number-one-rated basic cable network for 15 consecutive years. For more information or artwork, visit www.nickpress.com. Nickelodeon and all related titles, characters and logos are trademarks of Viacom Inc.
Broadway Across America (Producer) is owned and operated by British theatre producer John Gore (CEO) and entertainment industry veteran Thomas B. McGrath (Chairman). Broadway Across America presents first-class touring Broadway musicals and plays, family productions and other live events throughout a network of 40 North American cities. Under the supervision of Beth Williams (COO & Head of Production), Broadway Across America is also dedicated to the development and production of new and diverse live theatre for productions on Broadway, across America and throughout the world. Recent productions include Hair, West Side Story, Memphis and the West End production of Breakfast At Tiffany’s. Upcoming Broadway productions include the return of Irving Berlin’s White Christmas, Million Dollar Quartet and Minsky’s. 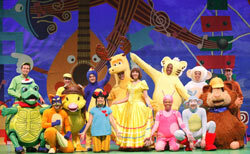 Touring productions include Nickelodeon’s Storytime Live featuring Dora the Explorer and Dreamgirls. For more information on Broadway Across America or to purchase tickets through an authorized agent go to BroadwayAcrossAmerica.com. Storytime Live! plays at the Citi Performing Arts Center Wang Theatre on Saturday, May 22 and Sunday, May 23, at 11:00 AM, 2:00 PM, and 5:00 PM each day Tickets are priced at $56 – $15; all prices include a $3.00 facility fee per ticket. Tickets for Storytime Live! are on sale at the Citi Performing Arts Center Box Office, online at www.citicenter.org or by calling (866) 348-9738. Discounted tickets are available for groups of 10 or more by contacting Citi Performing Arts Center Group Sales at (617) 532-1116 or at groupsales@citicenter.org.